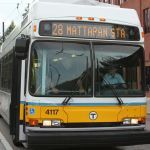 In case anyone didn't notice, for a long time, there was no MBTA CTC-1B #1634 either. 1634 was severely damaged in a collision with a backhoe up in Manchester-By-The-Sea while on route from Rockport to Boston, probably about five to ten years ago. I believe the collision occurred somewhere between West Gloucester Station and Manchester Station, although it may have occurred after Manchester. In any event, the backhoe was fouling the #2 track and damaged not only 1634, but three or four other coaches on the train. 1634 was repaired and finally put back into service earlier this year and looks like it is brand new. Last I saw 1634, it was on a five-car train powered by an MARC locomotive. 1607, one of the other coaches involved in the collision, was put back into service around the same time 1634 was, although I'm not sure about the other coaches. Maybe someone out there knows what happened to them. I will never forget the gallantry of the Conductor of train #570, William Ring, who refused medical attention at the scene until all passengers were safely evacuated and treated for their injuries. railfan1988 wrote: In case anyone didn't notice, for a long time, there was no MBTA CTC-1B #1634 either. 1634 was severely damaged in a collision with a backhoe up in Manchester-By-The-Sea while on route from Rockport to Boston, probably about five to ten years ago. I believe the collision occurred somewhere between West Gloucester Station and Manchester Station, although it may have occurred after Manchester. In any event, the backhoe was fouling the #2 track and damaged not only 1634, but three or four other coaches on the train. 1634 was repaired and finally put back into service earlier this year and looks like it is brand new. Last I saw 1634, it was on a five-car train powered by an MARC locomotive. 1607, one of the other coaches involved in the collision, was put back into service around the same time 1634 was, although I'm not sure about the other coaches. Maybe someone out there knows what happened to them. The other two coaches I believe were the 363 and 384. The 1648 was scrapped to repair the 1607 & 1634. They were wrecked AT Manchester-By-The-Sea in the summer of 2002 and all of the damaged coaches received some pretty moderate damage. The last time I rode on the 1634 it was trailing behind GP40WH-2 #67. I hope this answers your question! AEM7AC920 wrote: It has not been scrapped it has been retired and stripped after the fire but it is still in the same spot as it has been for how ever long now. So if the coaches sustained only moderate damage, why did it take nine years for two of them (1634 and 1607) to be repaired and put back into service? Also, the train must have had a German (500 series) coach attached to the locomotive...what ever happened to that coach? Another thread on here says that the two 300 series cars involved were put back into service sometime in 2006. Certainly is weird that two of the coaches took four years to be repaired, while the other two took nine years. In any event, thanks for the information you provided. I dont know how it could've taken so long for the two CTC-1Bs, but they must have had much more damage than the 300 series coaches. Your'e welcome by the way! In the 1634 accident only the first 4 cars were damaged, the forth cars(363) did not receive much damage. So the train must have stopped in time before it got the German car and locomotive. The other 300 car was the 366. All four cars were sent to the TTA factory in Bath NY, which was a subcontractor to Bombardier. They repaired the 363 and 366. For some reason they never repaired the two 1600s cars and they sat there for several years. Sometime in late 2009 or early 2010(I think) they were moved from NY to the Wilmington Car Company in Wilmington DE very quietly. sery2831 wrote: In the 1634 accident only the first 4 cars were damaged, the forth cars(363) did not receive much damage. So the train must have stopped in time before it got the German car and locomotive. The other 300 car was the 366. Now that you mention it, whenever I've seen the 366, I've noticed that it looks somewhat newer than the other 300-series coaches. Can't remember the last time I saw the 363, but next time I do, I'll be sure to look and see if it too appears newer. Also, it would be interesting to find out which locomotive was powering the train involved in this collision, even though the locomotive was not damaged. Maybe someone out there has the answer. And thanks, John, for the information you provided about this incident. I had been wanting to find out more about it for a while. The 363 was NOT repainted when it was sent out. Currently, it is in the full Wi-Fi wrap. Is William Ring that Billy Ring from the Boston-Newburport line or earlier the Boston-Haverhill line back in 2001-2005ish? Hope he is okay. Hope everbody was fine and severe injuries. Down here in Virginia the commuter line runs but honestly not like the MBTA service of MA. Anyone know if any pictures exist of the aftermath of the Back Bay reck in 1990? I have never come across any to date.